Earnest Sewn, online at earnestsewn.com, is the shop for unfaltering quality in denim and clothing. Earnest Sewn offers a fashionable selection of jeans for men, women, and kids, in a variety of styles and colors. Earnest Sewn carries corduroy, twill, denim, shorts, stylish knits, outerwear, wovens, and much more, in an addition to shoes, sunglasses, skincare, and other essential accessories. So enjoy quality classic looks with a modern edge at Earnest Sewn. But before you shop, get all the latest EarnestSewn.com discounts, Earnest Sewn promotions, and Earnest Sewn coupon codes found here at RetailSteal.com. Earnest Sewn delivers within the United States via UPS or FedEx. Earnest Sewn ships internationally via USPS Priority Mail Int'l or UPS. See site for more information. Save 15% on your purchase from Earnest Sewn. Use coupon code to save on denim, shirts, outerwear, shoes, accessories, and more - for a limited time only. Use this exclusive RetailSteal coupon code online at EarnestSewn.com and enjoy a 20% discount on any regular-priced item. Enjoy free shipping on any order at Earnest Sewn. Click here now and use coupon code. Enjoy a $15 discount on your purchase from Earnest Sewn. Click here and use coupon with purchases $100+. Shop the outpost section at Earnest Sewn and save up to 70% on jeans, apparel, and accessories. Click here now to shop. Save up to 40% on apparel and jeans from Earnest Sewn. Click link now to shop. Shop women's denim from $99 at EarnestSewn.com. Click here to shop. Save 35% on your Earnest Sewn purchase and receive free shipping with this coupon code! Enjoy free shipping on your Earnest Sewn purchase of $75 or more! 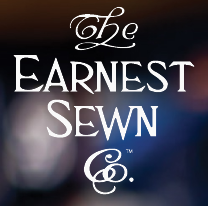 Enjoy 10% off your Earnest Sewn purchase when you enter this promotional code at checkout! Use our coupon code at Earnest Sewn online today to save $25 on purchases. Click link to shop. 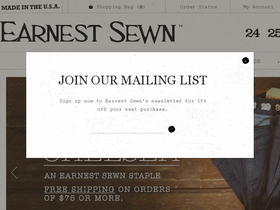 Save 20% sitewide at Earnest Sewn when you use this coupon code online.